There are 2 posts tagged challenge (this is page 1 of 1). Starting today, Caroline and I are going sugar free for the month of February. Technically we’re going “refined sugar-free”. Natural sugars, like the ones found in fruit and dairy are fine. We may have a tiny bit of raw honey from time to time, but in general we’re avoiding sweeteners. I don’t think sugar is my worst food vice (it’s Bread). However, I do think that sugar, while it may provide temporary energy, is an absolutely useless ingredient. There are zero redeeming qualities except that it tastes amazing. Eating sugar never seems to satisfy, it just makes me want to eat more. I wanted to reset our sugar habits because we seemed to be getting in the habit of “just one more treat”. And then that became a routine and suddenly we’re having second dessert, and third dessert (even if that’s only a 40 calorie piece of chocolate). 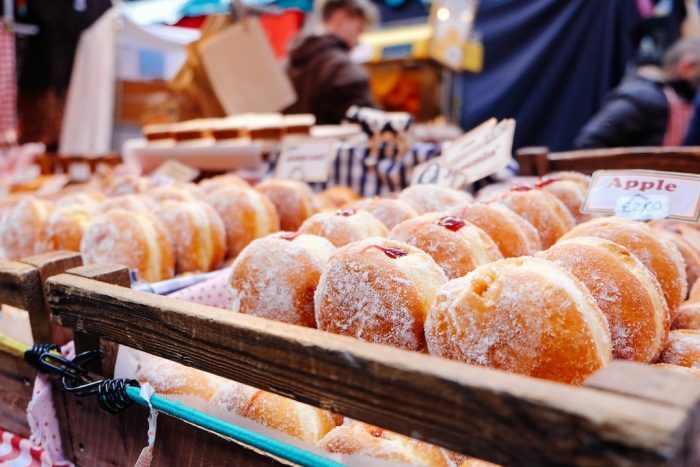 If we went 30 days without sugar, what effect would it have on our health? Would we still crave these things? Would it make a difference? It was going to be really hard to avoid sugar if it was easily accessible, so the first step was to clear it all out of the house. 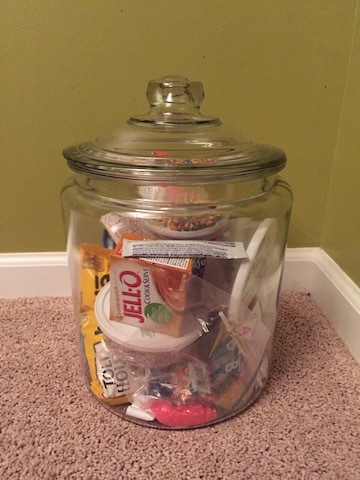 This is the jar containing all the sugary items left from our cupboard. We may or may not have eaten the other things before the month started. Cheerios. Only 1g of sugar. Really not a problem at all. We are going to avoid them, but we are keeping them for the kids. Sugar. Uh…yeah, we won’t be baking for the month, but neither of us eat spoonfuls of sugar. Simple syrup. For cocktails. No concerns that I’ll be drinking this straight. Knowing what we’re going to eat every day makes it much easier to stick to the plan, rather than having to come up with an idea right at mealtime. Especially as the day goes on, it gets harder to keep my willpower up. Knowing what is coming next, and not having to think about it, makes it easier. Try reading all the labels in the store and you won’t believe how many things have sugar in them. It’s hard to find non-sugar versions of certain food. I’m looking to you, whole wheat bread! Since we’re saying that natural sugar is OK for this challenge, we can still eat natural peanut butter. The only ingredient is peanuts, even if the nutrition facts show a couple grams of sugar. We found some bread with no refined sugars and switched our pasta to one made from quinoa. We bought plenty of fruit, Greek yogurt, oatmeal, eggs and avocados. OK, maybe I’m being a bit dramatic, but the rest is just to do it. Stop eating refined sugar. It sounds pretty simple. Ice cream: We eat these mint chocolate chip greek yogurt bars from Costco that are only 100 calories. They will be sorely missed. Chocolate: We usually have 1 piece of Dove chocolate per day. Breakfast cereal: Even bran flakes have 3g of sugar in them. Bran flakes! Salad Dressings: Lots of sugar in these, so we’ll be making our own for the month, since we eat salads for lunch 3x per week. We’ve been recreating a salad we ate in Peru that only used oil, vinegar, lime juice, salt and pepper. Restaurants: It’s really hard to avoid sugar when eating out, so we plan on cooking most meals at home. Marshmallows: Marshmallows are so good. Don’t you keep a bag in your pantry and eat straight out of it? Soft Drinks: Neither of us drink soda, so this isn’t difficult to cut out. I used to drink quite a bit but cut it out years ago. In my opinion, this is one of the most important changes you can make for your nutrition. Everything you drink should be near-zero calories. Water, coffee and tea. Luckily there are endless variations of those three beverages. In a perfect twist of irony, today’s xkcd is on this topic. While we weren’t really going overboard on these, I thought it would be interesting and challenging to see how we’d do without them for a month. Greek Yogurt. Instead of ice cream for dessert. LaCroix. Any zero-calorie, zero-artificial sweetener sparkling water will do. Black coffee. No sugar, no milk. My goal is to not knowingly eat any refined sugar for the whole month. I’ll report back in March with the results. Join me?